Those following @fishyfilaments on Twitter will have seen that we are exploring the Open Source concept, designed by @RichRap3D, called MasterSpool. The 3D printing filament market has reached a situation whereby each new length of material is bought on a new spool. Typically these spools are designed by the filament maker to meet their own criteria, fit their own design ethic and their own economic model. The dimensions of the spools are defined by the mechanical qualities of the filament, so they are all roughly the same size and shape, except for those suppliers that choose to distribute in different weights. A new plastic spool made to carry 1kg of filament will weigh somewhere around 250g, and could be as high as 350g. 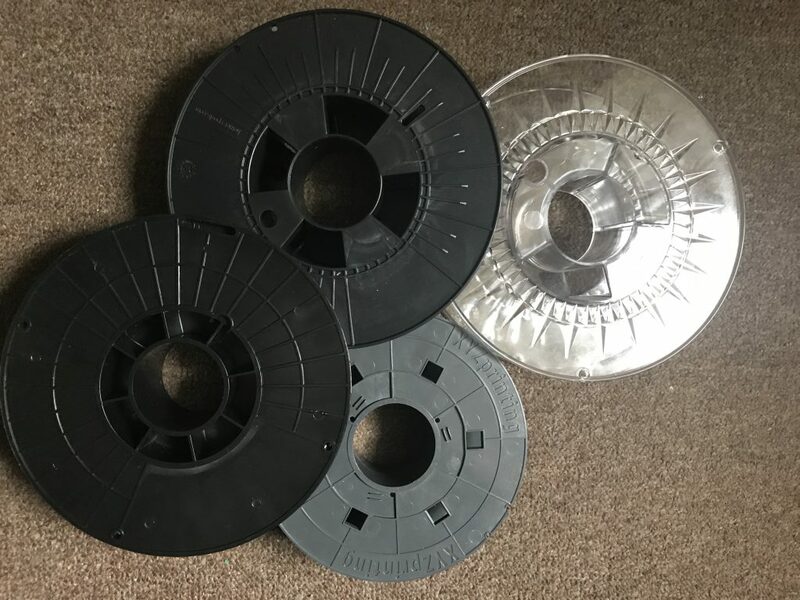 The polymers that they are made of don’t seem to be driven by anything except price-performance, so in the picture shown above there are spools made of polycarbonate (clear), polystyrene (non-expanded, black left), PLA (grey) and unmarked (black, top). Some filament makers (ProtoPasta, Filamentive, Re-Filament) use cardboard spools which tend to be lighter, but afford slightly less support when the filament is loaded into the printer or filament caddy. So what are the variables in play when a filament maker (like ourselves) decides how it will distribute its filament ? Cost of production is key, we are businesses after all, but don’t just think about the cost to buy each spool. the cost/benefit of scaling (cardboard spools get cheaper quicker than plastic spools). Next comes weight and cost to distribute. Obviously the lighter the better, but postage cost rises in weight bands so, for example, there isn’t as much benefit in taking a whole package weight down from 1.3kg to 1.2kg as there is from 1.0kg to 0.9kg. Most filament distributors will pass postage cost on to the customer, so the filament maker can choose to structure their product so as to benefit the customer or not. Hint – Look for producers advertising 850g spools, or smaller. They are the ones thinking about their customer’s wallets as well as their own. If you need the full kilo (or 2kg or 4kg) for a single job you won’t mind the extra postage, but most 3D printer users won’t need that amount of material on one spool. Moisture protection, in the form of desiccant packs loaded within a vacuum pack surrounding the spool, has become normal practice. The VacPack is a must but the desiccant seems often to be included for no other reason than other manufacturers are including it. Not all 3D printing polymers suffer from moisture absorbtion, and few are sensitive enough to degrade during transportation, especially if vacuum packed dry. After that its all aesthetics, and by aesthetics I mean non-technical, non-economic choices. Specifics like company ethos and marketing take over once the technical performance has been satisfied within the available price band. In our pre-production phase we costed an all-carboard spool with a resealable bio-degradable vacuum pack sent out in a protective cardboard box. It was the best option that was available and that fitted in with the company ethos of thinking through the whole lifecycle of our product and processes. The spool & box could be composted or recycled in most locations and the bag was an unavoidable necessity because filament storage solutions weren’t affordable off-the-shelf. We carried out a technical evaluation of several desiccant solutions and concluded that for our core product, recycled nylon, a moisture sensitive material, you’d need such a large desiccant pack to provide any real protection that its is actually better not include one. This will certainly put some potential customers off, but by putting the filament user in control of the material and its life-cycle we hope to encourage them to engage more closely with the filament, and through that engagement get better end results. Because we know that nylon is sensitive to moisture we believe that our job is to get the filament to the customer quickly and ready for preparation to use in its local context, not to provide a warehousing solution suggesting the potential for an infinite storage time. (We will explore how to prepare the filament for use and keep it usable in a later post). So we believed that we had minimised the environmental impact of our packaging as much as we could within our cost bracket, but of course we always have open minds about improving our solution. The idea behind the MasterSpool is that the filament travels but the spool doesn’t. The customer has a 3D printer so is able to produce their own spool to a common set of dimensions or from shared design files. That spool can be split and reloaded repeatedly instead of being disposed of. It saves production costs, transport costs and environmental overheads associated with the production and disposal of 250-350g of plastic for each kg of filament used. You need to add 3 reusable zip ties for transportation and storage, but the benefits are clear. The design needs a little refinement from the producer’s perspective, but as a concept its going to save customer’s on postage and producer’s costs too, and should help increase the sustainability of 3D printing.